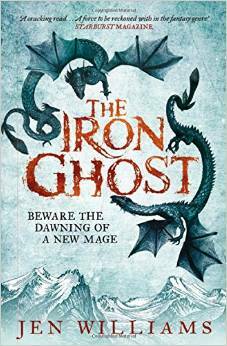 The Iron Ghost by Jen Williams is the sequel to her 2014 debut The Copper Promise (reviewed here). The follow-up continues the high fantasy adventures of the trio of central characters: Lord Frith (a mage and troubled former aristocrat), Sebastian (a former paladin banished from his Order because he fell in love with another knight), and Wydrin, aka ‘the Copper Cat,’ (a thief and fighter, always looking for the next escapade, or pay-day, or bottle of booze). Now mercenaries of some repute, having banished a dragon-deity to another dimension (which they inadvertently let loose in the first place), the trio dub themselves the Blackfeather Three, and are available for hire. They take on what they expect to be an easy gig: retrieving an object called the Heartstone, a source of natural magic, on behalf of clannish outpost of folk who craft golem-like automata from rock. Except the job is far from easy. The thieves of the Heartstone are a race of cold-blooded mountain dwellers living in sub-zero climates with an innate ability to command the cold. Plus, they have wyverns! And they themselves lose the Heartstone to a resurrected (and insane) mage from the previous millennium who is in league with a demon first confronted in the previous book. Which bears a grudge against our three heroes. Uh-oh. As you can tell from the above, there is no shortage of colour in this book: the people, places and creatures are all imbued with rich imagination and an element of surprise, giving the impression that literally anything could happen next, and often does. Once again, the emphasis is on action/combat, intermingled with more reflective moments, all glued together by the sparky interactions of the trio and the travelling companions they ally with. This gives the book balance in its pacing: scenes of action have urgency; explorations take enough time to describe what is discovered; and the dialogue is in turn spirited and spiky (though occasionally prone to exposition, particularly in the ‘talking to self’ moments). But the necessary pauses for breath are there too: central characters do consider why they do what they do, and the narrative depicts the impact of events on all involved. Their motivations are mixed, they make mistakes and bad decisions, mess things and get messed up. In this aspect there is a grittier, edgier tone than the previous book, marking a development in Williams’ style. When they group succeed, they do so imperfectly; nothing quite goes as planned—if indeed they have a plan—but they overcome the odds through a combination of courage, improvisation, skill, luck and sheer bloody-mindedness. Through it all there is a genuine sense of camaraderie reminiscent of the classic fantasy adventuring parties; also, the main characters evolve to show more dimensions than before, a crucial factor in sustaining interest across a trilogy. And in the irrepressible and irreverent, rum-toting, wise-cracking Wydrin there is a character to fall a little bit in love with—though if you told her that she would just take the piss out of you. 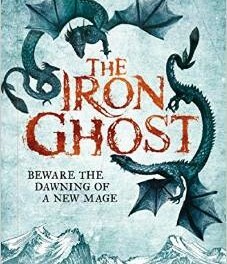 A highly inventive, vibrant high fantasy with a cast you can care about; fast-moving enough to ensure there is never a dull moment, but with sufficient depth to feel the outcome matters and sets up the final book.